My family just loves the beach. Sure, we love swimming and sunbathing, but we go to the beach all year round, even in the winter. A lot of people think we’re kinda weird, but we adore the salty air, the sound of the waves, the feeling of walking in the sand. Even if we can’t swim, we can take walks along the shore, play in the sand or fly a kite. 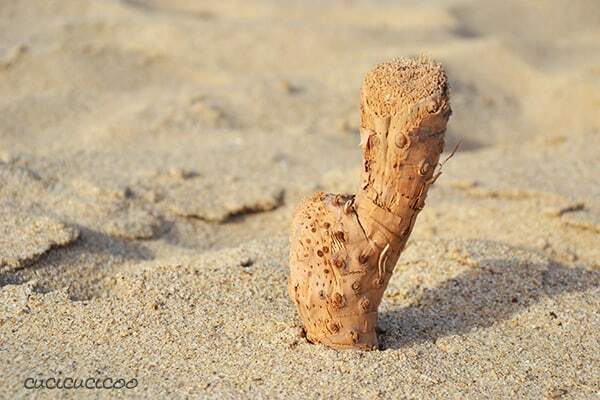 And we are also fascinated by some of nature’s amazing creations that we find on the beach. I’ve already written about the sea-washed pottery shards that I collect and make dominos from, but we also collect sea glass, shells, cool rocks, sand and driftwood. My kids have God knows how many containers of these finds, and I have all sorts of plans to use them in different ways (including a crocheted shell necklace, although my first attempt didn’t go so well). What’s that? Giant cane roots in driftwood form! You find these all over the place on Cilentan beaches, and some of them are pretty cool looking. That same vacation, we visited friends in the area. 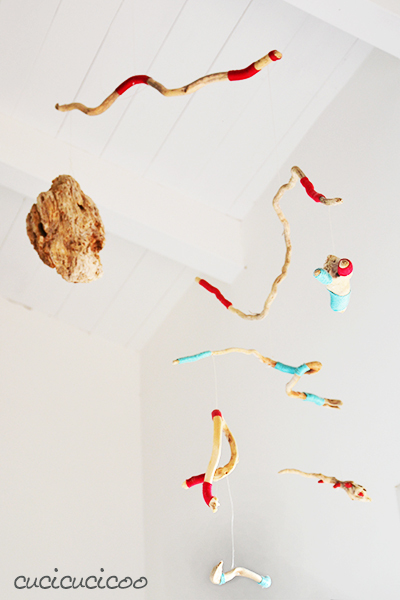 I fell in love with this driftwood mobile hanging in their home. 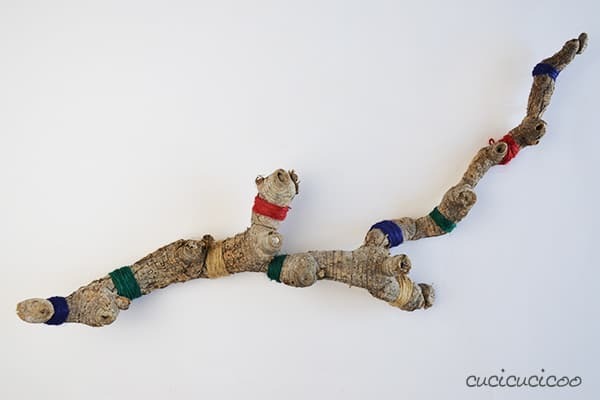 Inspired by the use of wrapping colored yarn or twine around driftwood and in desperate need of organizing my necklaces, I decided to make my own color-blocked cane root driftwood necklace holder! 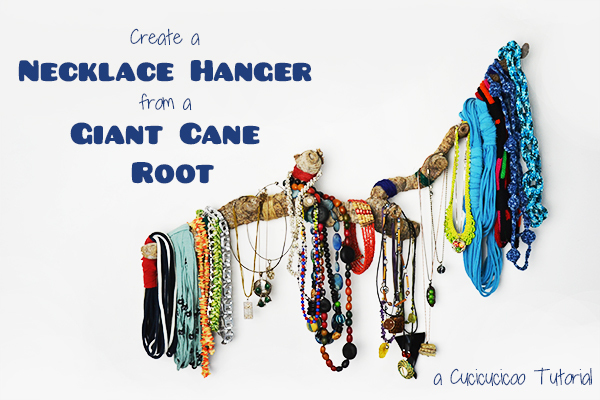 Would you like to find out how to make your own DIY necklace hanger? It’s easy and you don’t need any specific skills to do it, so just read on! First find a decent sized piece of driftwood (a root, branch or other wood) with lots of little knobby parts. Wash it and let it dry well in the sun. Then choose what to wrap the wood in. I chose some colored twine. I like the roughness of the twine and root together. 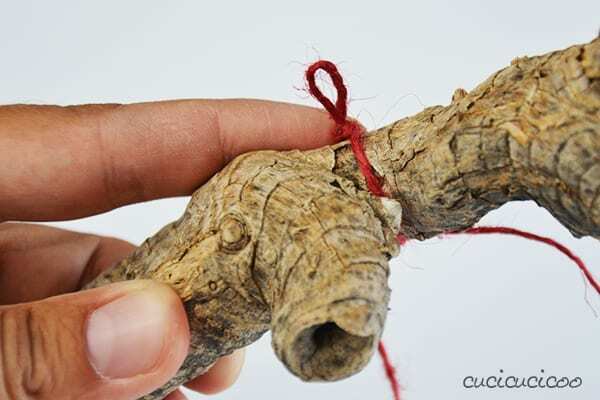 Hold the root up to the wall and make two or three marks on the back of it where it touches the wall. This is where we’ll hang it from. I didn’t want any complicated hanging systems, so I just decided to make little twine loops to hang the root on the wall with. I actually figured out an easier way to make these loops afterward, but I didn’t take pictures. I’ll explain that way after. The first way I did this was to fold the end of the twine and tie a knot, thereby forming a loop. I then positioned the knot at one of the marks made on the back of the wood, at the top back of the root. Next I wrapped the short end of the twine around the root, and then started twisting the long end around in the other direction, so that it covered the short end. And just keep wrapping and wrapping around until you like how it looks. 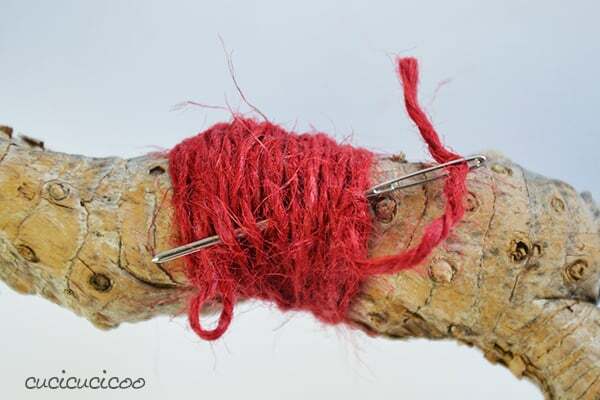 Cut the twine and use a tapestry needle (a needle with a large eye) to thread the end under some of the layers of twine in the back. It was at this point that I realized that I could’ve easily just threaded a little bit more of twine under the layers and tied a knot to make a hanging loop, instead of making it at the beginning and taking the trouble to position it correctly. You can choose whichever method you prefer. 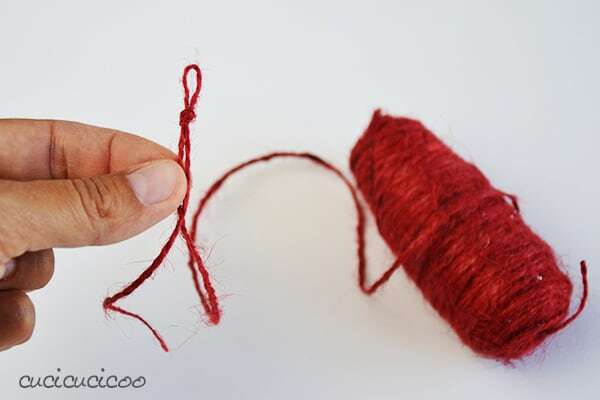 Wrap more twine with a hanging loop at the other marks you made for hanging. 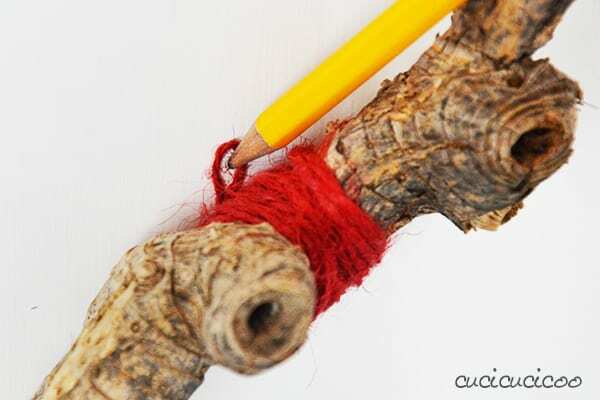 Then fill in the spaces as you like by wrapping yet more twine, but without the hanging loop, until the root or wood is covered as much as you want it to be. 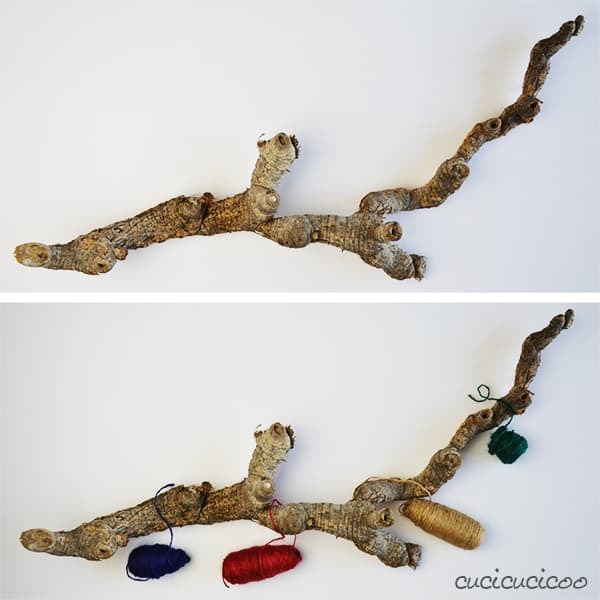 I chose not to use too much twine because I knew that a lot of the hanger would be covered by my necklaces, and I wanted the root to still be visible. 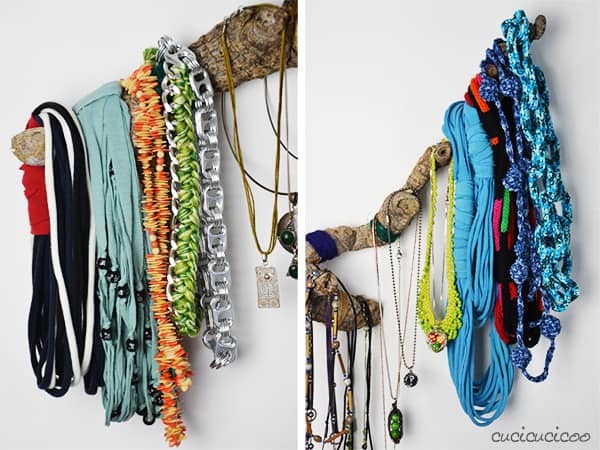 Now let’s hang your necklace hanger! 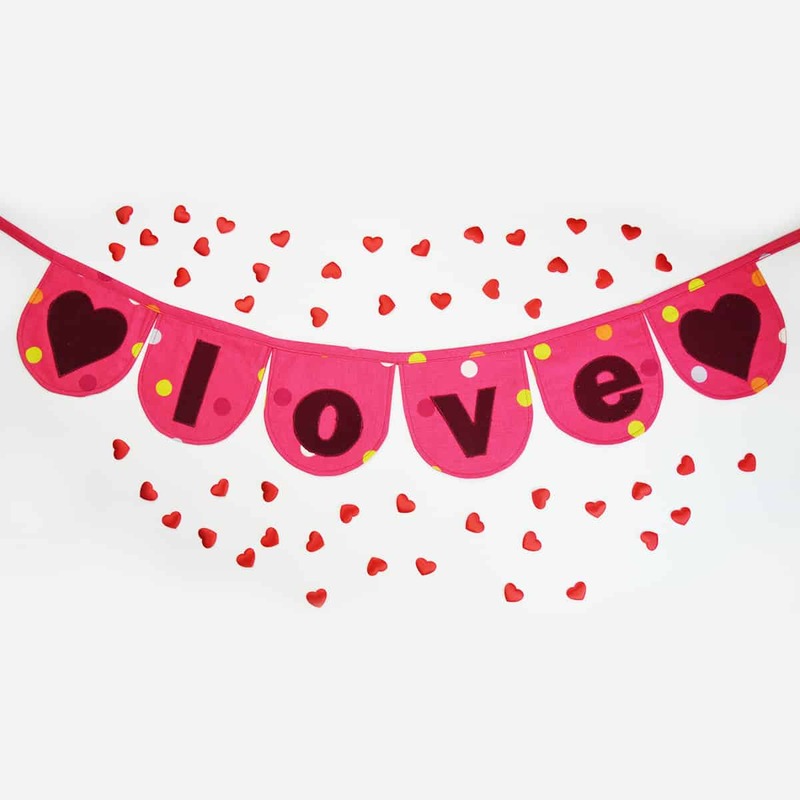 Hold it up to the wall, making sure that it isn’t crooked, and make a small mark on the wall in the middle of each hanging loop. Hammer a nail into each mark. 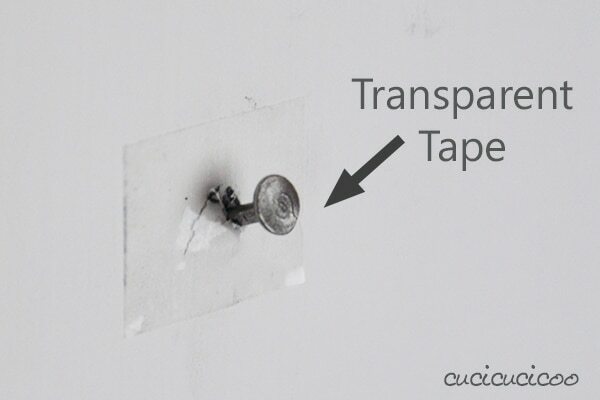 My brother-in-law taught me a great trick to keep the paint or plaster from crumbling off the wall when nailing into it; stick a square of invisible tape on the wall before hammering in the nail. It really works well! Ok, from the picture here, it doesn’t look like it works because there is a little crack in the plaster, but trust me, our wall got a terrible plaster job and it crumbles like crazy, so this is a huge improvement. 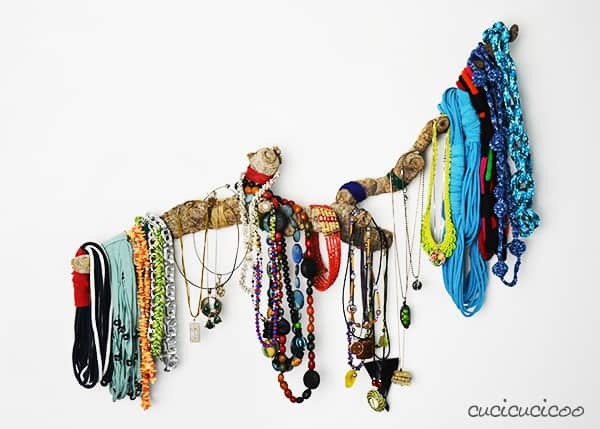 Now hang up your decorated driftwood and fill it up with your necklaces! Because the back of the root is not perfectly flat, there are parts that stick out from the wall and are perfect for hanging things on. I also hang necklaces on the little knobby protrusions and, in the middle of the root, where it’s harder to hang from, I open the necklaces up and slip one end behind before closing the clasp again. This way I get a lot of things on there! What a relief to take my necklaces out from the tangled mess in my jewelry box and hang them in a more orderly fashion! Before I couldn’t see all of them at once, so I ended up just wearing the same ones over and over, while I now wear much more varied neck decorations! It’s also nice to be able to more easily admire my own necklace creations. On the left you can see my sleeve necklace, Buddhist prayer bead necklace, melon seed necklace, and braided chain necklace. On the right you can see a shortened necklace chain, a knitted beaded necklace, a t-shirt necklace, a knitting mill necklace (to be blogged), a Ball and Chain necklace and a crochet chain necklace. If you find a really big cane root or just any big piece of driftwood, you can attach knobs recuperated from old drawers to make a cool coat rack, like my friend Michele did. 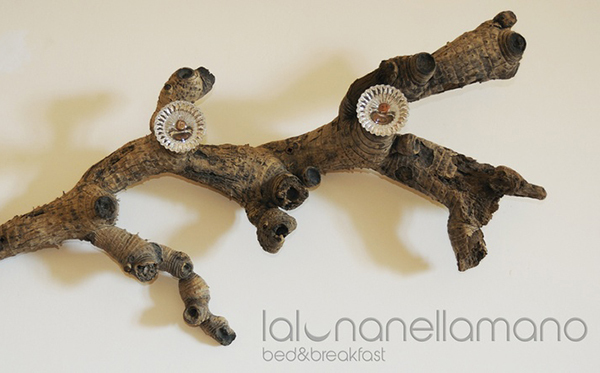 The funny thing is that I got the idea to make this necklace hanger when we were staying at his B&B, not even realizing that he had done a very similar thing himself! 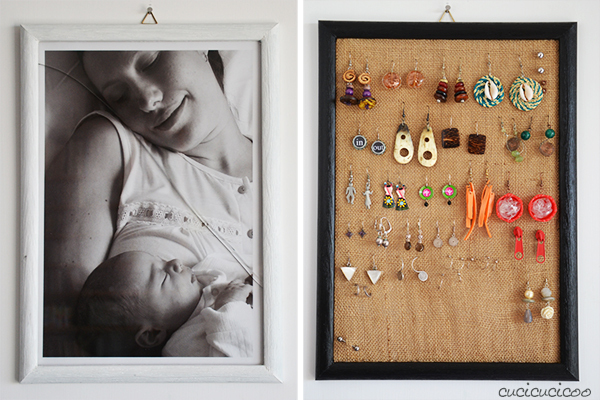 If your jewelry is in a big mess, don’t forget to look at my tutorial to make a DIY earring display from an old picture frame and a burlap bag! Question of the day: How do you organize your jewelry? I used to keep all my jewelry in random jewelry boxes and other containers. They would get in a horrible mess. I would forget about some items hidden under other ones. I couldn’t always find what I was looking for. I even broke a couple of necklaces trying to pull them out of the tangled mess. These two jewelry organizers have made my accessorizing life so much easier now! And it’s funny to look at the picture of the earring frame above, because it looks so empty. It’s totally filled up now! 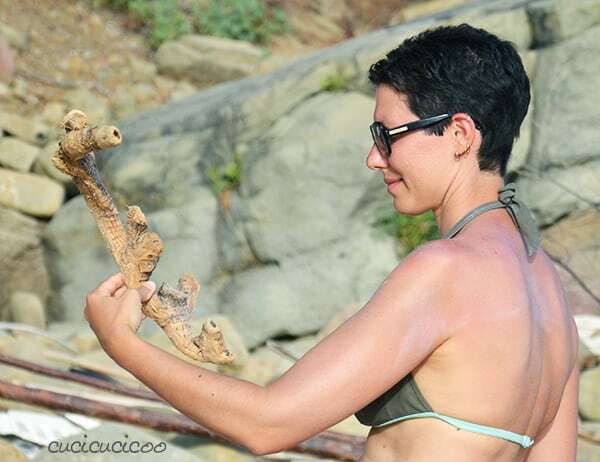 molto bella.. io purtroppo con due bimbe ancora piccole non mi attento ancora a esporre le collane, rischierei di vedere cadere tutto nel giro di un paio di minuti!! Quindi sono tutte nascoste nell’armadio.. e infatti ne metto sempre poche e sempre le stesse! Wow, sei coraggiosa, Federica, perché non portavo proprio collane ed orecchini per anni quando i miei bambini erano piccoli! Ho appeso il porta collane in alto, dove non possono proprio arrivare, solo io!